Vito Montelli coaching in St. Joseph’s Class LL Championship Game win over Fairfield Prep in 2011 at the Mohegan Sun Arena. 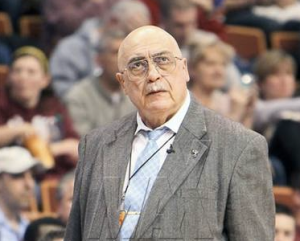 STRATFORD, Conn. – It was a big day in the world of Connecticut High School boys basketball as legendary St. Joseph’s Academy (Trumbull) boys basketball coach Vito Montelli announced his retirement today after 50 years at the helm. Montelli is the only coach in the history of the St. Joseph’s program, and won his 11th CIAC Class LLÂ State Championship last season. Assistant Coach and former player Chris Watts has been named the program’s new head coach. Click here to check out the Connecticut Post’s story on Montelli’s retirement. Click here to read the New Haven Register’s story.